Fueled by a substantial increase in sales dollar volume from Canadian buyers, foreign investment in U.S. residential real estate skyrocketed to a new high. In all five of the top feeder countries buying U.S. real estate, the number of transactions grew, according to an annual survey of residential purchases from international buyers released by the National Association of Realtors® (NAR). In addition, more than half of all the foreign purchases took place in only three U.S. states: Florida, California and Texas. NAR's 2017 Profile of International Activity in U.S. Residential Real Estate found that between April 2016 and March 2017, foreign buyers and recent immigrants purchased $153 billion of residential property – a 49 percent jump from 2016 ($102.6 billion) and passing 2015 ($103.9 billion) as the new survey high. Overall, foreign buyers purchased 284,455 U.S. properties (up 32 percent from 2016), and their purchases accounted for 10 percent of the dollar volume of existing-home sales (8 percent in 2016). "The political and economic uncertainty both here and abroad did not deter foreigners from exponentially ramping up their purchases of U.S. property over the past year," says Lawrence Yun, NAR chief economist. "While the strengthening of the U.S. dollar in relation to other currencies and steadfast home-price growth made buying a home more expensive in many areas, foreigners increasingly acted on their beliefs that the U.S. is a safe and secure place to live, work and invest." Although China maintained its top position in sales dollar volume for the fourth straight year, the significant rise in foreign investment in the survey came from a massive hike in activity from Canadian buyers. After dipping in the 2016 survey to $8.9 billion in sales ($11.2 billion in 2015), transactions from Canadians this year totaled $19.0 billion – a new high for Canada. Yun attributes the notable rise in Canadian activity to U.S. markets that are expensive but still more affordable than properties in Canada. While much of the U.S. continues to see fast price growth, home price gains in many Canadian cities have been steeper, especially in Vancouver and Toronto. "Inventory shortages continue to drive up U.S. home values, but prices in five countries, including Canada, experienced even quicker appreciation," says Yun. "Some of the acceleration in foreign purchases over the past year appears to come from the combination of more affordable property choices in the U.S. and foreigners deciding to buy now knowing that any further weakening of their local currency against the dollar will make buying more expensive in the future." Foreign buyers typically paid $302,290 – a 9.0 percent increase from the median sales price in the 2016 survey ($277,380) and above the sales price of all existing homes sold during the same period ($235,792). Approximately 10 percent of foreign buyers paid over $1 million, and 44 percent of transactions were all-cash purchases (50 percent in 2016). Rounding out the top five, the sales dollar volume from buyers in Canada ($19.0 billion), the United Kingdom ($9.5 billion), Mexico ($9.3 billion) and India ($7.8 billion) all increased from their levels one year earlier. 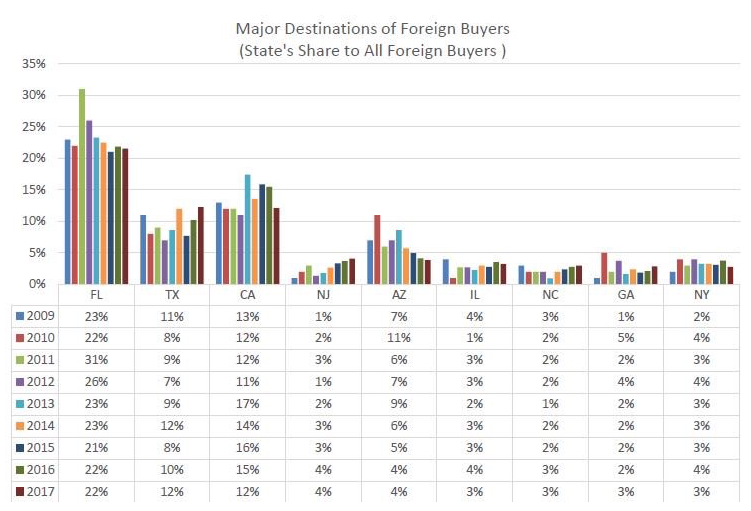 This year's survey again found that foreign buying activity is mostly confined to three states. Florida (22 percent), California (12 percent) and Texas (12 percent) maintained their position as the top destinations, followed by New Jersey and Arizona (each at 4 percent). Florida was the most popular state for Canadian buyers. Chinese buyers mostly chose California, and Texas was the preferred state for Mexican buyers. The upswing in foreign investment came from both recent immigrants and non-resident foreign buyers as each increased to new highs. Sales to foreigners residing in the U.S. reached $78.1 billion (up 32 percent from 2016) and non-resident foreign sales spiked to $74.9 billion (up 72 percent from 2016). "Although non-resident foreign purchases climbed over the past year, it appears much of the activity occurred during the second half of 2016," says Yun. "Realtors in some markets are reporting that the effect of tighter regulations on capital outflows in China and weaker currencies in Canada and the U.K. have somewhat cooled non-resident foreign buyer interest in early 2017." Looking ahead, Yun believes the gradually expanding U.S. and global economies should keep foreign buyer demand at a robust level. However, it remains to be seen if the shortage of homes for sale along with economic and political headwinds end up curbing sales activity to foreigners. "Stricter foreign government regulations and the current uncertainty on policy surrounding U.S. immigration and international trade policy could very well lead to a slowdown in foreign investment," says Yun. NAR's 2017 Profile of International Activity in U.S. Residential Real Estate, conducted April 10 through May 1, surveyed a sample of Realtors to measure the share of U.S. residential real estate sales to international clients, and to provide a profile of the origin, destination and buying preferences of international clients, as well as the challenges and opportunities faced by Realtors in serving foreign clients. The 2017 Profile of International Activity in U.S. Residential Real Estate can be ordered online or by calling (800) 874-6500. The report is free to NAR members and accredited media and costs $149.95 for non-members.